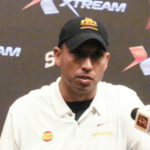 Success on the field is leading to success on the recruiting trail as Iowa State coach Matt Campbell signed a 20-man recruiting class that may be ranked as the best in program history. With recruiting over for now attention shifts back to next week’s Alamo Bowl against 13th ranked Washington State. While the coaches were wrapped up in recruiting Campbell says the players stayed focused on preparing for the Cougars. The 24th ranked Cyclones are 8-4.